I believe this day provides us a reason to celebrate for those of us here in the United States! Although we may disagree on many things, even on how much and in what way we are able to impose our religious views and beliefs on our fellow citizens, we all agree on the value of this freedom. The foundation of the Christian Faith is about making the choice to follow Him. Our ability to choose without fear or coercion allows us to grow authentically in our Faith and in relationship with God. This freedom allows us this gift. Faith is a choice that requires freedom. I’m glad our county recognizes this. 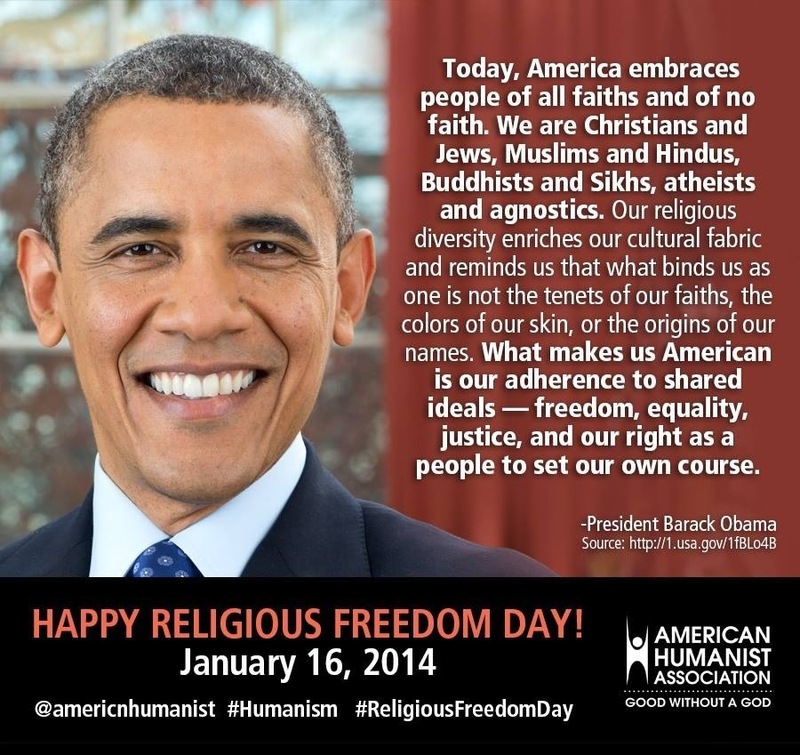 Happy Religious Freedom Day! This post is in harmony with something that God has brought to my mind for some while, because He leads me to oppose coercion / intimidation in various forms, and therefore to promote freedom. As part of this, it has been essential to trust Him, because He has had me stand face-to-face with those who were trying to intimidate me into doing what they wanted me to do, and some of these seemed to be potentially dangerous men. What has been revealed through these experiences has been that these intimidators were, essentially, bullies, but also that they had themselves been the victim of bullies in the past. This leads on to a second realization, that people can respond by going along with the behavior imposed on them, and reproduce it, or they can react to it and oppose it by behaving in the opposite way. I think that this means they are either unable to listen to God, and so go on to oppose His ways, or are able to listen to Him and respond to Him. It might even be why He chooses certain people and not others, that is, it is what they do with the hand that they have been dealt by life. Some people seem to have a terrible life right from early childhood, yet still seem to be gentle and kind, while others seem to be born with the proverbial silver spoon in their mouth, yet are the most unpleasant and uncaring people later in their lives. I really enjoyed hearing if your experience with handling those bullies and agree very much with most of what you said! I believe that God constantly is choosing each of us and yet either we ignore, dismiss or defy His Will for us… sometimes out of fear or ignorance or we listen to Him and follow the light. I also find it interesting how different people respond to His Call on their lives… some totally rebel, others cower… and yet many embrace His directions and integrate them as their own. I try and aspire to do the latter, however being human at times I fail. Good News: He always seems to reach for me again. I truly appreciate your comment! Thank you! Firstly Ann, while I feel flattered by your thanks, it is really God whom you should thank, as it was He who led me here, and He who gave me the words to give to you. Again, your comments draw others from Him through me, because they lead on to another thing that He has had me consider, which is how some believers (and here I refer to speaking-in-tongues Christians) can be overcome by thorns in their lives. To explain this, I am referring to the parable of the sower, where some seed fell among the thorns, so although the seed grew, the plants were stunted and (in one Gospel) were not fruitful. It is in three Gospels, and the explanation given is that the thorns represent life’s worries or the lure of riches or other attractions. What God has had me understand from this is that things coming from the past can cause these believers to stumble when they come to a trial / test. It seems relevant, in regard to the two believers who are my example, that both were Roman Catholic before they heard the message of Truth. Although I do not know the exact reason why both (males) have stumbled, or on what, in one case it almost certainly concerns an elder in the church where he too was an elder. The suspicion is that he accepted some sort of guidance from this other elder when he should have trusted in his own interpretation of the Bible. The relevance of the RC background is that he would have been exposed to the hierarchy of that church, and might have felt that he had to defer to the seniority of the other man. In the other case, the guy told me that he had received something from the Bible, but that he had lost it when he too had spoken to this same elder. This leads me on to another thing to which God has guided me from early in my walk with Him, and that is the need for us all to understand that we are in His presence, and so His guidance is always available to us. We should therefore learn from Him and let no-one come between us and Him. The most powerful passages that supports this are the two examples where disciples, in one case Peter and John, and in the second case all of them, were brought in front of the Sanhedrin and ordered not to preach about Jesus. The reply of Peter and John was that they should judge for themselves which was right, to obey them or to obey God, and the reply in the second case was that they ought to obey God not men. There are many words in the epistles of Paul that seek to wrest control over other people by verbal intimidation and claims of authority. Who has more authority than God?